Yes, I got that mistake. Its like headline is at one position(horizontally) and also at high position. Life line either pulls up/resides down.And in doing so, either gets connected to headline or disconnected from it. So, its high setting/low setting of life line that matters and not the connection/disconnection with the headline. HS life line + disconnected head line = ? LS life line + connected head line = ? No, Kiran. The connection/disconnection with the head lline matters as well: I already described the statistics, I have described how it's significance gets confirmed in my family as well, and I have also explained it also from a fundamental point of view (by pointing out that 'independend thinking' is much more likely a characteristic that correlates with introversion ... not extraversion). So, I could have described it as an independent factor...but I decided not to do that for various reasons - e.g. because at the end combining features becomes essential anyway. I hope this makes sense now. By the way, don't worry... next month I will start presenting more detailed materials, including the statistics for each of the 13 hand signs in the female population + smaller male population. Regarding Extraversion I would simply prefer to say that those combinations 'neutralize' each other. hi Kiran, I was thinking of the nature of many people with earth handshape (and other earthy characteristics on the hand). eg, often spend time alone, reserved etc. I guess my comment is irrelevant anyway as there were no earth hand shapes in this study. Thanks for asking the questions you have asked about this study, I was thinking some of the same questions. Thanks for your replies Martijn. I'd be interested to see a bigger study that also involved men and people with an average or lower than average IQ, rather than just women with higher than average IQ. Then we'd get a more representative sample of the general population. Lynn, by principle from a technical point of view it is by principle better to study a homogenous population - to avoid that factors like sexe, ethnicity influence the results. I ask for your consideration regarding this point because we know that finger lengths, major palmar creases & dermatoglyphics include male-female differences. For this reason I think it is for example very hard to compare the hand shape of a male with the hand shape of a female... especially since the exact differences have never been mapped by the detail. This 'problem' became the reason why I started my study focussing on this (homogenous) female sample. But I will work on mapping the male-female differences regarding hand shape more precisely in the future - because this Extraversion study shows that my approach to map hand shape via 3 ratios (FL/PL | FL/PB | PL/PB) is promissing to become valuable. E.g. my study indicates that the finger length to palm length (FL/PL) plays no role at all in identifying Extraversion... but the other 2 hand shape ratios do matter! Next month I will present a new 'multi-perspective palm reading' article on Extraversion where I will share the statistical details for this female population... plus the statistics for a small male population as well. And then I will also present more specific guidelines for how to COMBINE the hand signs - where finding hand signs in multiple perspectives will become essential. I agree with you that “Everybody Has Some Introversion and Some Extroversion Traits”. And I add that it depends on the circumstances. Environment is greater than man. There can no one who is fully extroverted or fully introverted as there is neither pure happiness nor misery. You can say after having used all the keys in complete hand analysis that you are ‘more inclined to be extroverted’ or introverted. Extrovert is the ‘Psychology’ of a person who is concerned more with practical realities than with inner thoughts and feelings, being concerned with the social and physical environment; then DEEPER, STRAIGHTER head line that proceeds towards mount of Mars is expected comparing with the heart line. For all this purposes sufficient courage and resistance is needed and that will be supplied by this mount especially if the hand has a STRONGER wire to carry the current. Introvert is the ‘Psychology’ of persons who tend to shrink from social contacts and become preoccupied with their own thoughts, turn inside, the contemplation of their own thoughts and desires and conducts, then here DEEPER HEART LINES are expected than headlines and have slopes downside towards mount of Moon. To simplify the assessment whether a person is extrovert, the following points should be considered; a broad hand with preferably spatulate nails, whorl patterns on finger tips, especially on little finger, the ‘course’ of head line and, a preferable ‘slightly’ joined head-life lines. These symptoms are sufficient to reveal easily the extrovert trend or such soul psychology of a person. Much detail may complicate the things. Other symptoms in this regard are secondary in this regard such as a curved heart line, longer and deeper life line which runs around the mount of Venus and not on it, longer ring finger. Besides that emotions change of course. It is a continue process. So, you can tell about present trend only. No guarantee for the future. A 'balanced' personality has a well proportioned lines and hand formation who can be extrovert and introvert as time required. We all know very well that Lines change according to our thinking, attitudes and acts and experiences. Soul psychology is deciphered by fingertip patterns so ulnar or radial loops will definitely tell their own stories. Okay fine Martijn. The explanations are not convincing. I'll look forward for more details. Thank you. Hi Martijn, I wrote those lines, to bring up the point that trying to co-relate INtrovert/INdependent by the formation of words will not deduct anything here. As a trained linguist I appreciate Kiran drawing attention to this. I didn't want to be a stickler, but the two prefixes have nothing to do with each other. Only the IN in independent is really the prefix "in-", from Latin in- (not), from Indo-European root ne. The IN in introvert is actually the prefix "intro-", from Latin intra- (within), from Indo-European root en. And yes, my hands are somewhere on this forum ... not quite sure when I posted them, last year some time. Lynn wrote: I'd be interested to see a bigger study that also involved men and people with an average or lower than average IQ, rather than just women with higher than average IQ. Then we'd get a more representative sample of the general population. OK I understand what you are saying about studying a homogeneous population. So I'll rephrase my earlier post to say: I'd be interested to see a similar study on men's hands. Actually I think your first post here is a bit misleading, because it says "This article presents a brand new model for recognizing the hand of an 'extravert'" but you didn't mention the specific factor that it only applies to women with higher than average IQ. (it is mentioned at the end of the article, but not on the announcement at this board). In reply to a previous post, yes I remember Sheldon's somatotypes, people used to refer to them a lot years ago but you don't hear much about them now. why/how do they neutralise each other? anyway I look forward to the further details next month. I get your point from a pure linguistic point of view. (The words 'introvert' & 'independent' both can associated with a tendency of a person to focuss inward and think/act starting from 'I' (me); so I think from a psychological point of view that it is quite obvious that the letters 'in-' in both words do relate to the meaning of both words! Afterall, in both words the letters 'in-' are used as a PROPOSITION - which is defined to refers to something that is or appears to be enclosed or surrounded by something else... in this case that something is the 'I' (the 'me'). Okay Kiran, I understand that you look forward to more research details (next month). PS. By the way, in my response to Kiwihands I have shared more details describing how psychological research has pointed out that 'introversion' & 'independ minds' tend to correlate. Lynn, I have the impression that you misunderstood some part of my comment referring to the male-female variations for hand shape. I only tried to describe that a hand shape comparision between males and females is kind of problematic. And for that reason I decided to exclude men from my study... just to make the study more simple. But I see no reason to assume that the results would become different for men (nor for people with an average IQ). By sharing info related to the sexe, ethnicity, IQ & age of the studied subjects, I have only described that both groups are homogeneous - which lowers the risk that the results are resulting from other variables (because we know that hands tend to vary for sexe & ethnicity, and in a lesser degree to IQ & age). Sorry, I think your use of the word 'misleading' is not accurate here - because studying a 'homogeneous' population... actually puts MORE value to the results! But I fully understand that you are looking forward to see more details, especially regarding men. If 2 markers combined make a clue (+! ), one could describe each of them as +1/2. If 2 other markers combined make a different clue (-1), one could describe each of them as -1/2. So where I used the word 'neutralise' I meant to say that the netto-effect of such combinations of features becomes 'zero'. Parender, thanks for sharing your ideas. By the way, I have analysed of the fingerprints as well... but found no significant differences at all between both groups. Regarding your suggestion that a pinky whorl as a marker for extraversion: in my sample 3 out of 20 extroverts have a whorl on at least one pinky finger; but the percentage is not higher compared to the group of introverts, where 2 out 14 have the pinky whorl on both hands. And the percentages for each group sort of fall within the range of normal (which is another important observation in order to draw conclusions). By the way, a percentage not far above 10% for a pinky whorl is just perfectly normal for Dutch hands. Therefore this small Dutch population points out that a whorl on the pinky finger is unlikely to be significant marker for (high) extraversion. PS. I also checked for radial loops, for both groups the percentages are within the range of normal as well. I don't think I misunderstood you. Not sure how I gave you that impression. Martijn (admin) wrote: Sorry, I think your use of the word 'misleading' is not accurate here - because studying a 'homogeneous' population... actually puts MORE value to the results! maybe misleading is the wrong word. But it took me a while to notice that the study was only about women with above average IQ. Until a study is done on men with above average IQ, or women with below average IQ etc. we don't know if the results apply to everyone. OK. As the two things were noted together as 'one clue', I didn't know how much emphasis was placed on the setting and how much on the (dis)connection, but if it is 1/2 & 1/2 then I understand better what you were saying to Kiran. hi Catseam, thanks for posting your link. Yes I think it is possible to be both extravert & introvert in different situations / various ways. I think for understanding the results of my study properly it is important to know that next to the categories 'extraverts' and 'introverts'... there is a third category in between: which we could describe as the 'intermediate' - which applies to the majority of people who do not tend to show explicitely consistent behavior regarding this (important) personality dimension. To make it more explicite how I identified the 'extraverts' and the 'introverts' in my study, it is important to be aware that in the NEO PI-R questionnaire the Extraversion dimension is assessed with 48 questions (statements relating to 6 sub-dimensions: Activity - Assertiveness - Excitement Seeking - Gregariousness - Positive Emotions - Warmth; e.g. 8 questions for each sub-category), where the individual is asked to assess each statement in terms of a 5 category multiple-choice answer (from the top of my head: varying from something like... 1 - never, 2 - only sometimes, 3 - neutral, 4 - often, 5 - very often). Which implicates that only about 10% of people can be recognized to behave consistently as an 'extravert' (which can be associated with the high scorers), and about 10% of people can be recognized to behave consistently as an 'introvert'. The groups in my study (20 extraverts + 14 introverts) where selected from a larger group of about 180 females - who all performed the NEO PI-Rquestionnaire. Regarding most people who appear to show a combination of extravert & introvert behaviors... those are very likely to belong to the third (intermediate) category. Catseam's astrology-profile is just an example of this (though such profiles often tend to include elements that can be associated with the so-called Barnum-effect). 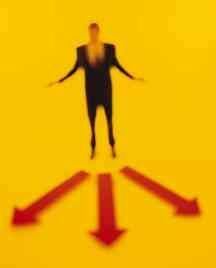 Also, when people enter a new phase (or a phase of crisis) in their lives, they nearly always tend to behave (slightly) differently for a while... but by principle one should not mistake that as if their personality has changed permanently. Afterall, it is only common sense that when people have the flue one will not recognize all parts of their normal behavior; and the same is true for those who suffer for (temporary) mental illness, etc. I hope this additional info is helpful to understand the results of my study better. PS. In the MBTI questionnaire 50% of people is assessed in the E-category (extravert) and 50% of people is assessed in the I-category (introvert)... which sort of creates as 'flip-flop' situation where people can move from the one category into the other category because of just 1 slight change in the answers; and even when people have a balanced mix of extravert- and introvert behavior... they will always end up in one of the two categories anyway. This also implicates that far most people inside each of the MBTI's E- and I-group will likely end up somwhere in the third 'intermediate' category (normal scores varying from 3 to 7) of the NEO PI-R questionnaire. ... During the past week I have entered the second phase of this study (via studying a sample of males); the first results look promissing and indicate that especially finger length and palm shape appear to display the most significant clues regarding extraversion/introversion. - mixed hand shapes dominant for FIRE are very common among extraverts (females: 52%; males: 85%), while these are much less common seen among introverts (females: 25%; males:50%). -mixed hand shapes dominant for WATER are often seen among introverts (females: 60%; males: 21%), while these are far less often seen among extraverts (females: 20% ; males: 0%). 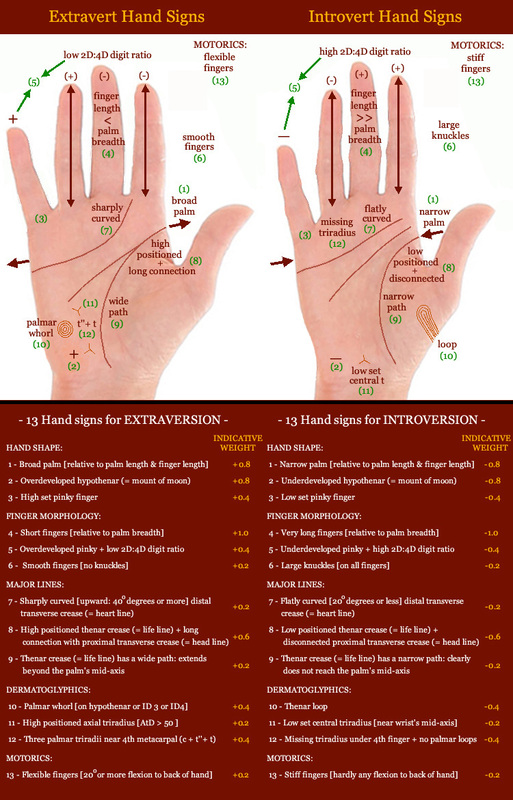 - 6 hand shapes were dominant for AIR, and 5 of those relate to one of the extraverts (females: 10%, males: 7%). - None of the hands in the studied samples are dominant for earth. Next to the 'hand shape' it appears that the development of the 4 corners of the palm provides other important clues (the ulnar corners of the palm had already been adopted in the earlier results... but I am working on adopting at least one of the other two corners in the 'phantom hand model' as well). By combining hand shape with the two ulnar corners of the palm it is possible to discriminate more than half of the male extraverts and introverts, and almost half of the females extraverts and introverts. ... In terms of the so-called 'hand index' (= known as a biometric measure) the size of the hand shape difference between extraverts and introverts is comparable with the hand shape difference between males van females. Generally men are known to have relatively wider palms than women (all around the world); however... in this study the average palm ratio in introvert men indicates that they have relatively (slightly) narrower palms than extravert women. Hand types: athletic (left), leptosome (center), and pycnic (right). "The leptosome–asthenic type (ectomorph) has long, slender hands characterized by long fingers. The athletic type (mesomorph) shows rougher, wider hands, but overall, the best balanced. The pycnic type (endomorph) has a short, wide dorsum and short, conically formed fingers." The article 'Defining the Basic Aesthetics of the Hand' (2005) describes the basic characteristics of the 3 hand types that were first described by the psychiatrist Ernst Kretschmer. Though the association of body types with personality traits is no longer influential in personality theory... the results of my study indicate that introverts typically have a leptosome hand type, including: long, narrow, slender hands that are featured with long knotty fingers. NOTICE: In psychologist William Herbert Sheldon's classification the leptosome body type is known as the ectomorphic somatotype. PS. Both in Kretschmer & Sheldon's body type psychology the leptosome/ectomorph has been associated with "introversion and timidity"
Cannot understand why a palmer whorl contibutes to extravision. Thought that would have meant secrecy and deepness. jeanette wrote: Cannot understand why a palmer whorl contibutes to extravision. Thought that would have meant secrecy and deepness. Well, it's not easy for me to explain this association by detail. But for a start: I perceive whorls representing unconscious sources of energy, and one of the six fascets of extraversion relates to energy - so that makes some connection. Palmar whorls below the fingers have been associated with a talent for foreign languages - which probably relates to another fascet of extraversion: the aspect of sociability. But I acknowledge that in the field of hand reading so far there had not been made a connection between extraverion and palmar whorls. Anyway, dermatoglyphics appear to represent (probably) only a minor feature for extraversion. NOTICE: I am in the process of studying some male extraverts & introverts, and I can report that in both male groups I have not found any palmar whorls (and for this reason I expect that role of the whorl is not very likely to become much stronger than what I have described about that feature so far). Have I managed to answer your question? "Measurements on the hands of introverts & extraverts reveal that introverts tend to have longer fingers than extraverts, while extraverts tend to have wider palms than introverts. How surprizing are these results really?" I have now concluded that the 2D:4D digit ratio appears much more significant compared to the development of the pinky finger. PS. Ed's thinking is focussed on the aspect that relates to the 2D:4D digit ratio; he experiences problems to understand the results in the perspective of his own concepts regarding the thumb-side and pinky-side of the hand. Ed described how he associates the thumb-side with 'extraversion' and the pinky side with 'introversion'... in response I have now pointed out that this idea has never been described in the hand reading literature at all (apart from the fact that the words extraversion and introversion are not even mentioned in Ed's book 'The Encyclopedia of Palmistry' - which I have many times recommended). And I have also pointed out that in Vedic Palmistry and spiritual/esoteric Palmistry, the thumb is associated with inner man. "Die individualität ist der göttliche Kern der inneren Personlichkeit. Das Äussere ist der Ausdruck des inneren. Art und Ausdruck des "Ich" haben wir im Daumen"
The word 'chirosophia' (chirosophy) was already used in the times of the Old Greeks: 'xier' = hand, 'sophia' = wisdom; I think one could say that the in the later 'chirologia' (chirology) the existence of God and the soul was not required as an assumption. I can report that I have now also studied the 4 corners of the palm + the palmar zones below the 4 fingers more precisely. The results indicate that the length development of the 4 zones below the fingers hardly play any role in Extraversion at all. But the relative development of the two lower corners of the palm (development of the hypothenar/mount of moon versus the thenar/mount of venus) has produced significant results for the males and the females. This implicates that the weight of hand sign 2 (which will be revised into a comparison between the hypothenar and thenar) will become much larger, and the weight of hand sign 3 (= setting of the pinky finger) will become much lower. The next update will concern the aspect of the palmar lines! PS. I have used for the very first time a new research method to assess the relative length development of the 4 palmar zones... and the results are quite fascinating: the hands of males and females do not vary at all regarding this aspect of the hand (contrary to what one might expect based on the many reports that have shown for the 2D:4D digit ratio - so I think I have found very solid evidence that sexe variation only manifests in the finger length... but hardly in the underlying palmar zones! ).